Many of us start our day with a cup of coffee or green tea in an attempt to invigorate our body and mind. Although this can be a great way to get going, there is an even healthier, more affordable option. Kyani Sunrise is a carefully designed blend of potent vitamins, trace minerals, superfoods, and antioxidants that can help fortify the body’s systems for the entire day. This one-of-a-kind nutritional powerhouse provides a dose of high-quality nutrients that have been extensively tested, combined, and measured to exceed the medical community’s recommended daily allowance for a natural, healthy supplement. As the name suggests, Kyani Sunrise is the ideal way to begin each day with the full range of nutritional requirements that the body needs. In addition to the more than 20 essential vitamins and minerals provided by each serving of Kyani Sunrise, it also features a host of superfoods including wild blueberries from Alaska. Numerous studies have determined that the impressive health enhancing properties of blueberries are a result of their rich antioxidant content. Each daily serving of Kyani Sunrise boasts five times the amount of antioxidant protection than any other products available. This is due to its high content of Resveratrol, an antioxidant – obtained from the skins of Wild Alaskan Blueberries – that helps support supple, resilient skin and a healthy cardiovascular system. Wild blueberries from Alaska have almost double the antioxidant power of any other types of blueberries on the planet. It has been reported that blueberries subjected to the harsh Alaskan environment end up with 1000 percent higher antioxidant properties than blueberries harvested from farms. 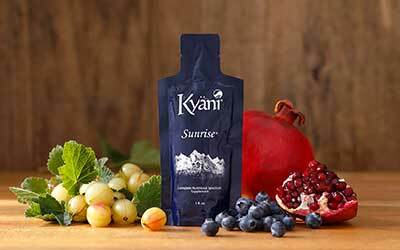 If you are looking to set your body up for success each day, Kyani sunrise might be a great option for you. Its powerhouse blend of nutrients and minerals can serve as a healthy, invigorating way to begin each morning.